There are a fair few ways to let others see your masterworks: you can create an app, share a dashboard or create and share a report URL. 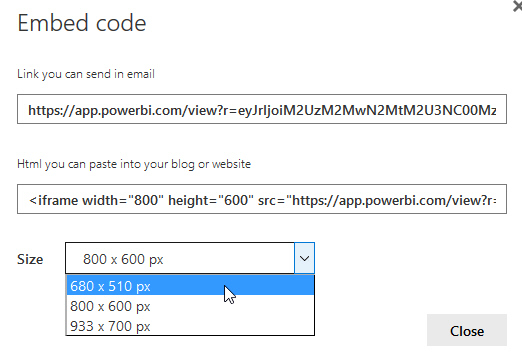 This blog explains all of the ways that you can choose to share your Power BI reports and/or dashboards. Sharing a report as a PDF file, PowerPoint presentation, etc. This blog is part of a longer series, which together comprise a full online training course in Power BI Service. You can see get details of our classsrom Power BI training courses here. 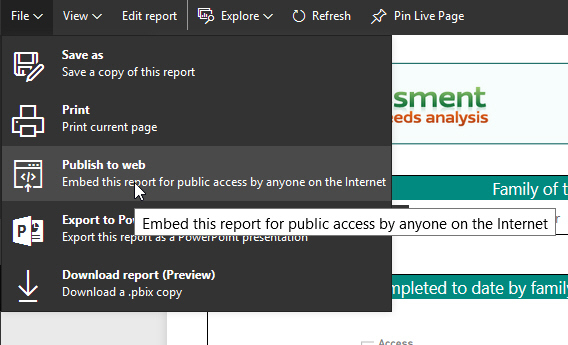 I've already covered this in one guise under sharing a report, but this feature allows you to embed a Power BI report within another webpage. Like this, in fact! As someone who has spent ages trying to get embedded reports to work on websites in the past, I'm happy to report that this works beautifully! With the report selected, choose this menu option. A sample of the HTML for the link at the top of this page.